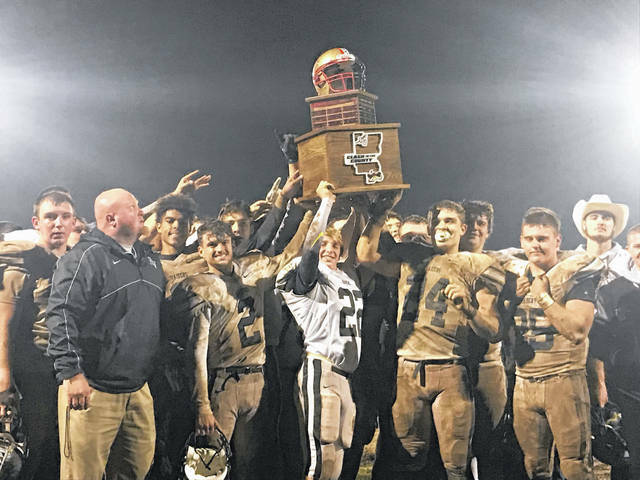 Members of the River Valley football team lift the first Clash of the County championship trophy on Saturday night following an 8-0 victory over host South Gallia in a Week 10 battle of Gallia County teams in Mercerville, Ohio. 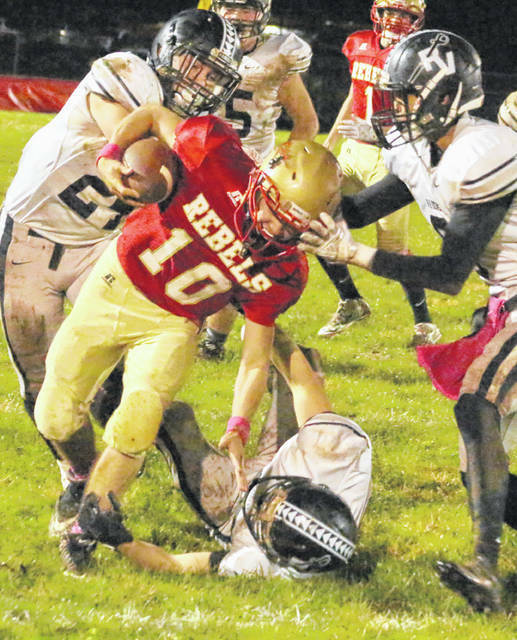 South Gallia senior Garrett Saunders (10) fights for extra yardage during the first quarter of Saturday night’s Week 10 football contest against River Valley in Mercerville, Ohio. MERCERVILLE, Ohio — A lot of mud went into this historical snowman. In the first-ever gridiron meeting between Gallia County programs, River Valley made just enough plays to secure the inaugural Clash in the County championship on Saturday night during an 8-0 victory over host South Gallia in the Week 10 regular season finale for both programs. The visiting Raiders (1-9) produced the game’s only score late in the first quarter as Jared Reese hauled in a 15-yard touchdown pass from Jordan Burns with 53.3 seconds remaining. Cole Young added a successful conversion run that accounted for all of the game’s points. The contest itself, however, turned into a chess match, with both teams having to take conservative approaches due to the wet weather conditions that turned the playing surface into a sloppy mess. The end result was a game that collectively featured nine punts, four drives that ended in loss of down, and a quartet of turnovers — all of which came in a drama-filled fourth quarter. The Rebels (3-7) had their final three offensive possessions end with interceptions while attempting to tie things up, but the Silver and Black also committed a costly turnover with 2:12 left in regulation. River Valley, though, made the needed stops down the stretch, allowing first-year head coach Jason Peck to pick up his first victory with his alma mater. Coincidentally, Peck’s first win with the Raiders comes against his former team, which he led to two playoff appearances in seven seasons at South Gallia. Afterwards Peck noted that both programs put forth a win-worthy performance, but he was glad that his new troops — especially the seniors — were finally able to taste victory headed into his first full offseason. The only complaint that Peck had, however, was that this victory had to come against a place that he has a lot of great memories of. “I want to give a lot of credit to the South Gallia players, coaches and fans. They were very respectful and showed a lot of class on this field tonight, which shows the amount of respect that this community has for its team,” Peck said. “It’s bittersweet in some ways for me, because of the respect that I have for that school, but I am glad that my kids can finally celebrate a win. We’ve endured a lot of adversity over the course of this year, but we continued to work and battle to get better — and we’re headed into the offseason with a victory. The Red and Gold outgained River Valley by a 203-131 margin in total yards of offense, plus claimed a 13-9 edge in first downs. The Raiders, however, finished plus-2 in turnover differential and did have the only score of the night. The hosts had three punts for an average of 25 yards and also had three drives end on downs. The Silver and Black punted six times for a 29.8-yard average and lost possession on downs only once. For SGHS coach Mike Smith, the night was a bit of a head-scratcher because his players executed the game plan to near-perfection. But, as the second-year mentor noted, the Rebels just didn’t have anything to show for their Senior Night performance. “I thought our kids gave a tremendous effort, especially on the defensive side of the ball. We made a lot of the plays that we needed to make when we needed to make them, but we just couldn’t get the ball into the end zone,” Smith said. “Both teams played their hearts out, but that’s the disappointing part because we played well enough to win this game tonight. The first three drives of regulation led to a punt and two turnovers on downs, allowing the guests to take over at their own 46 with 5:13 left in the first. Facing a fourth-and-five at the SGHS 15, the Raiders completed a 9-play, 54-yard drive as Burns floated a perfect lob over the shoulder of Reese in the front right corner of the end zone — making it a 6-0 contest. Young added the 2-point run for an 8-0 edge with less than a minute left in the opening frame. Both teams traded punts over the next four possessions, giving the Rebels the ball at their own 28 with 3:05 left in the half. South Gallia put together the longest drive of the night by either team, ultimately covering 71 yards in 12 plays down to the RVHS one. On first down at the Raider 24, Tristan Saber found Jacob Birtcher with a 23-yard completion that left one second on a stopped clock as the chains were moved. The Rebels tried to quick spike the ball when the ball was whistled lived, leaving three-tenths of a second on the clock at the time. The officials, however, determined that the full second had expired during the spike attempt and called an end to the first half. The Rebels held a 109-73 advantage in total yards at the break, including a 48-22 edge through the air. Neither team committed a turnover and both squads had six first downs. Both teams traded either a loss of downs or punts over the first five drives of the second half, which led to the Rebels having possession at their own 34 early in the fourth. South Gallia strung together an 11-play drive that ultimately ended with the first turnover as Will Hash picked off a Saber pass, giving the Raiders possession at their own 35 with 5:20 left. RVHS marched down to the hosts 34 in four plays, but fumbled away the next snap. Jared Ward recovered the fumble for the Rebels at their own 32 with 2:12 remaining. After three straight incompletions, Reese picked off a Saber pass and returned it to the SGHS 49 — giving the Silver and Black possession with 1:52 left. A quick three-and-out forced a Raiders punt that gave the Rebels the ball at their own 34 with 55.6 seconds left. South Gallia covered 30 yards five plays, but the sixth snap ended with Saber being picked off by Young — giving the ball back to RVHS with 21.1 seconds left. The Raiders took a single snap from their own 34 and went to a knee, winding out the clock and wrapping up the eight-point outcome. The Rebels outrushed the guests by a 123-94 margin and were also penalized six times for 62 yards, while the Raiders were flagged eight times for 85 yards. Trevor Simpson led RVHS with 45 rushing yards on 12 attempts, followed by Reese with 40 yards on 12 carries. Young added 21 yards on seven totes. Burns finished the night 3-of-11 passing for 37 yards, throwing one score and zero interceptions. Reese hauled in all three passes for 37 yards and a score. Kyle Northup led SGHS with 66 rushing yards on 18 carries, followed by Gavin Bevan with 24 yards on seven attempts and Garrett Saunders with 22 yards on eight tries. Justin Butler recorded two of the Rebels’ three sacks, with Jeffrey Sheets providing the other sack. It was the final home football game for seniors Chad Bostic, Wyatt Rapp, Tanner Dennison, Garrett Saunders, Tristan Janey, Gavin Bevan, Tristan Fox and A.J. Woodall in the Red and Gold. It was also the final football game for seniors Layne Fitch, Trevor Simpson, Dakota Hunt, Chase Kemper, Reece Thomas, Dylan Lemley, Nathan Michael, Alex Williams, Derek Johnson and Ty Vansickle in the Silver and Black. 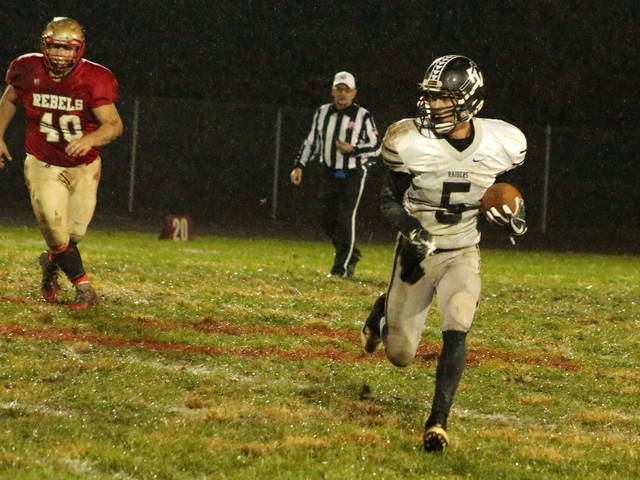 River Valley was seventh in TVC Ohio play this fall after going winless in six contests. The Rebels finished sixth in TVC Hocking play with a 3-5 mark.